The Barrier, UnderConcrete In Floor Radiant Heat Insulation. The Barrier™ Under Concrete Insulation is the #1 material for under concrete radiant barrier insulations applications in the North America. Its ease of use, high-performance values, and cost effectiveness has made this product the a sought after material in the underground radiant floor insulation industry today. As you know, there are two key components regarding under concrete insulation materials. Its ability to resist heat / cold transfer, and its ability to resist or stop moisture flow in its various transmittal forms. What is the Cold Stopping Power of The Barrier™ / BarrierXT™ / BarrierX5™ / BarrierHL™ / XBoard™ Under Concrete Radiant Floor Insulation? The Barrier™ / BarrierXT™ / BarrierX5™ / BarrierHL™ / XBoard™ have been rigorously tested to ASTM procedure C-518 and conforms to standard industry values for EPS foam insulation. The Barrier™ / BarrierXT™ / BarrierX5™ / BarrierHL™ / XBoard™ test data results show that as part of a concrete assembly with a layer of sand and gravel included adds to the overall R-value of your assembly. Further technical details can be found by downloading brochure available here. While the above performance numbers are extremely impressive - as you know - there are two parts to an effective underground insulation product. The second key aspect is a material's Water Permeability. Without an excellent moisture and vapor barrier in an underground insulation material - its R-Value is meaningless. The Barrier™ / BarrierXT™ / BarrierX5™ / BarrierHL™ / XBoard™ ability to resist water transmission of all forms is remarkable. Tested to the standards of ASTM E96 Procedure B (standard test for water vapor transmission), The Barrier Permeance results were under one signifying a vapor retarding material. Its Permeability test results were no less astounding - also less than one. Simply put, virtually NO moisture travels through this material. Quite simply - this material virtually eliminates any form of moisture transmission in an underground application. Is there anything comparable on the market to The Barrier™ / BarrierXT™ / BarrierX5™ / BarrierHL™ / XBoard™ Under Concrete insulation? No. Bubble Foil material products will try to sell you on the reflectivity and insulation values of their foil products - but they omit the fact that the - the sun was not shining underground - so the "reflectivity" aspect is - excuse the pun - nothing but hot air. Properly used, reflective foil insulation such as NOFP's Microfoil, works wonderfully in "air cavity" installations such as when applied to the underside of a floor joist where there is an airspace, but in the absence of an airspace the product reverts to just its mass insulation property. In addition, the Canadian Mortgage and Housing Corporation ("CMHC") (an equivalent to the U.S. Federal Housing Authority) funded a study comparing underslab insulation materials and found that the concrete with bubble/foil/bubble insulation "did not look like it had any insulation underneath". 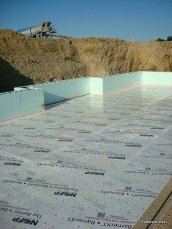 Furthermore, The New Hydronics - a Canadian publication geared to the radiant heating industry, published an article recapping the CMHC claiming that the "Bubble Burst" and to not use reflective foil products under the slab because of the absence of an airspace for the reflective foil to work as intended. There is an increased 3" seaming flange running the lineal length of the material with a 1" double-faced tape adhesive along the other edge. This patented self-sealing feature allows for extreme ease of use and NO SEAMS. The material is flexible. You can walk on the material without cracking or breaking. The core component is an EPS with surface facing skin - and heavy-duty poly film laminated to EACH side. The product is lightweight, and can ship via UPS or common carrier anywhere in the world. For purchasing or any further information, please contact your local distributor or Northwestern Ohio Foam Products directly at 800-339-4850 or e-mail to info@nofp.com. We will be more than happy to assist in your cost-effective upgrade to the #1 underground insulation on the market today.